This Help article describes how to set a number of properties that let you change the fonts, colors, size, margin, etc., of labels, titles, and legends in a RadHtmlChart. Example 1 shows how to set four different fonts plus different colors and size, eventually creating Figure 1. Bold - A Boolean value that indicates whether the text will be bold. Color - A string representing the color of the text. It can take a common color name or a hex value (e.g., "red", "#ff0000") when set in the markup and a value of type System.Drawing.Color when set in the code behind. FontFamily - A string representing the font-family of the text. More information is available in the next section, using the FontFamily property). FontSize - An integer for the font size of the text in pixels. Italic - A Boolean value that indicates whether the text will be italic. Margin="15" - All four margins are 15px. Margin="15 30" - Top and bottom margins are 15px, right and left margins are 30px. Margin="15 30 45" - Top margin is 15px, right and left margins are 30px, bottom margin is 45px. Padding - Takes from one to four integers that specify all the labels' paddings in pixels (see Margin property above). 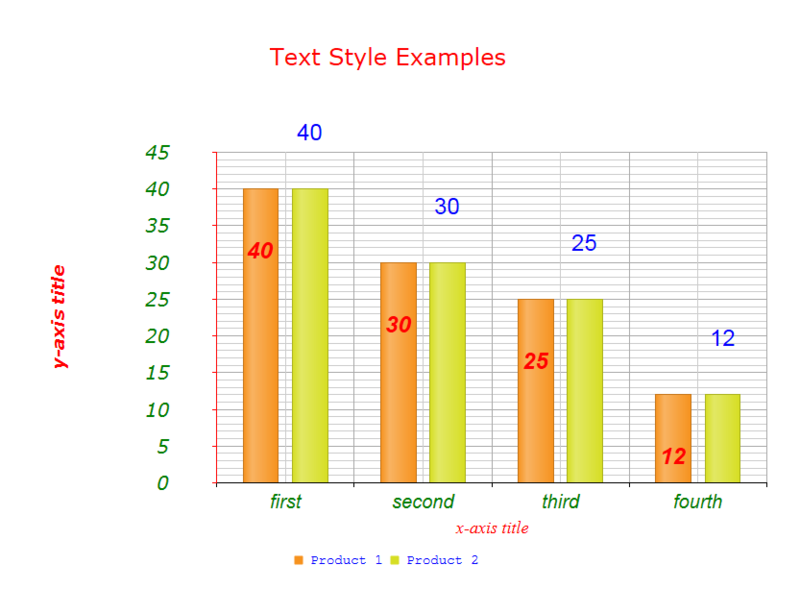 Figure 1: An HtmlChart with different fonts, sizes, colors, margins and padding. Example 1: This example shows how to set fonts, colors and size for labels, the legend and title of the Column chart in Figure 1. <TextStyle Color="Red" FontFamily="Arial" FontSize="24" Padding="10" Bold="true"
<TextStyle Color="Green" FontFamily="Verdana" Italic="true" FontSize="20" Padding="20"
<TextStyle Color="Red" FontFamily="VERDANA" Italic="true" FontSize="18" Bold="true"
Font1,Font2,Font3 (e.g. FontFamily="Times New Roman, Arial, serif"). Use the FontSize property under TextStyle to set the desired size of the font.It always works together with the FontFamily property to create the final settings for the font. Table 1: The default font settings for different RadHtmlChart elements. The property holds several font names that act as a "fallback" system. This means that if the browser does not support the first font, it will try the next one. If none of the listed fonts are available, the browser will use its own default font. The last font can be of generic-family type (e.g. serif, sans serif, cursive, etc. ), so that the browser can pick a similar font in the generic family,in case the other one is unavailable.